Camino Real Site is an Archaeological Conservancy preserve located just outside Santa Fe, New Mexico, and it is one of the few remaining examples of Spanish Colonial settlement in the southwest. Camino Real Site is located in a remote region south of Santa Fe near the Santa Fe River. The site contains the ruins of a Spanish Colonial Rancho, or farm, that was occupied sometime between AD 1610 and 1680, the time of the Pueblo Revolt. When Santa Fe was founded in 1610, ranchos were established along water ways near the city for easy access to markets and trade. This was also an era of uncertainty and turmoil, as the Spanish settlers were under constant threat of attacks from nomadic native tribes. This is demonstrated at Camino Real Site by the remains of a defensive structure that is believed to be a torreon or tower. The site consists of several additional structural features including the remains of a a four-room home and a corral. Camino Real Site is a rare gem, as many Spanish Colonial sites in the southwest have been destroyed by urban sprawl and persistent looting. The site was was discovered during utility work and acquired through a private donation. For over 20 years, The Conservancy has worked hard to preserve this important cultural site and protect it from vandalism and looting. The Archaeological Conservancy Board of Directors recently paid a visit to the site as part of their annual meeting. Colorfully painted sherds still decorate the desolate landscape, reminding visitors of a time when Santa Fe was only in its infancy. 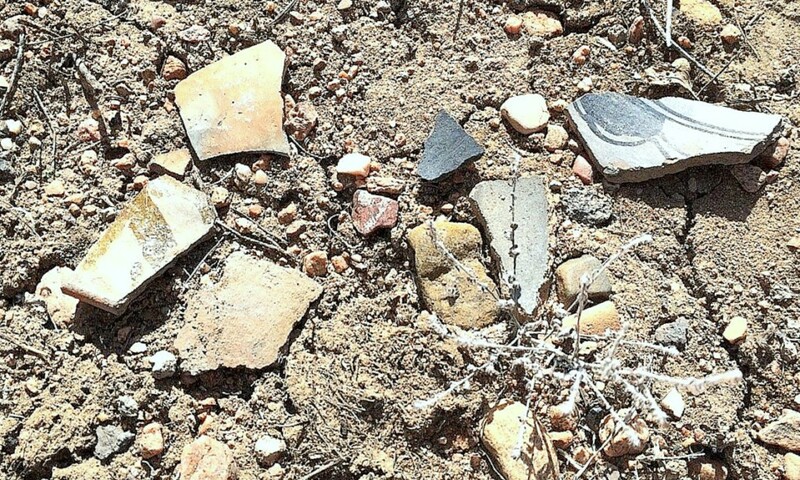 At first glance, the pieces might lead one to believe that this area was a Pueblo site. The early Spanish settlers commissioned and purchased pottery from local Pueblos for use as storage and cooking vessels. This style of pottery is found at various Spanish Colonial settlements throughout New Mexico. Since land documents were destroyed during the Pueblo Revolt, it is difficult to attach an actual name to the property, but it’s clear that the owner played a role in the early colonization of Santa Fe. As one of the last of it’s kind, the site offers insight into how early settlers lived and survived on the harsh and, often violent, New Mexico landscapes.